This chunky guy makes me smile. He’ll make you smile too if you look at his face. Big ‘ol open mouth grin with eyes that match most of his blue shirts. He doesn’t keep any secrets and isn’t afraid to show his feelings. Most of the time his feelings are of utter happiness, squealing and laughing at everything. Sometimes, he’s a grouchy mess of a hungry baby because you aren’t putting food in his mouth fast enough. 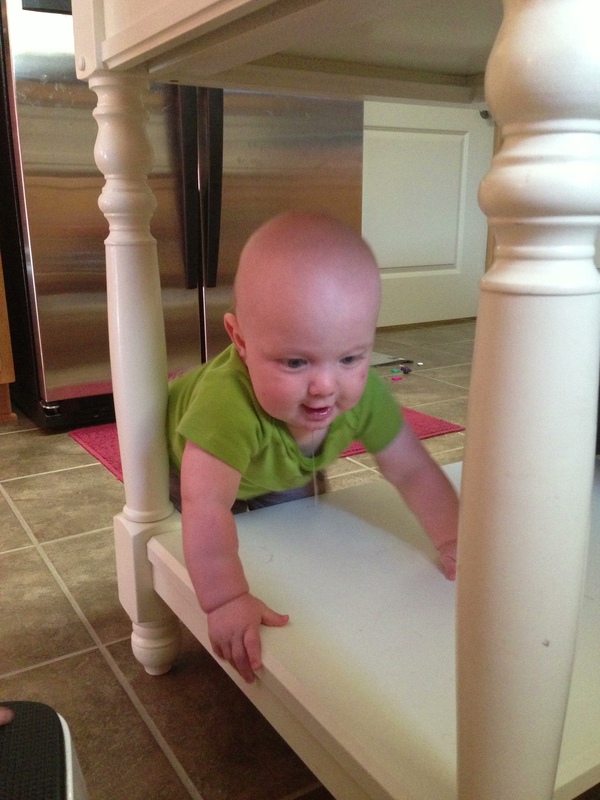 He lets you know by pounding his chubby hands on the high chair tray and screaming at you. He turns on the tears if he’s really going for drama. He mastered rolling places and is fluid and smooth about his movements. The biggest change is that he has stopped using his head as the lead. You blink and he’s playing with the register. Or Wrigley closes his eyes for just one minute and wakes up to grabby hands trying to “pet” him. So, we’ve reached that phase. The one where things are no longer safe. A phone gets knocked out of your hand, food gets lunged at, you can’t drink anything without a left hook trying to connect, and dinner tables are no longer easy places to hold a baby and, eat. 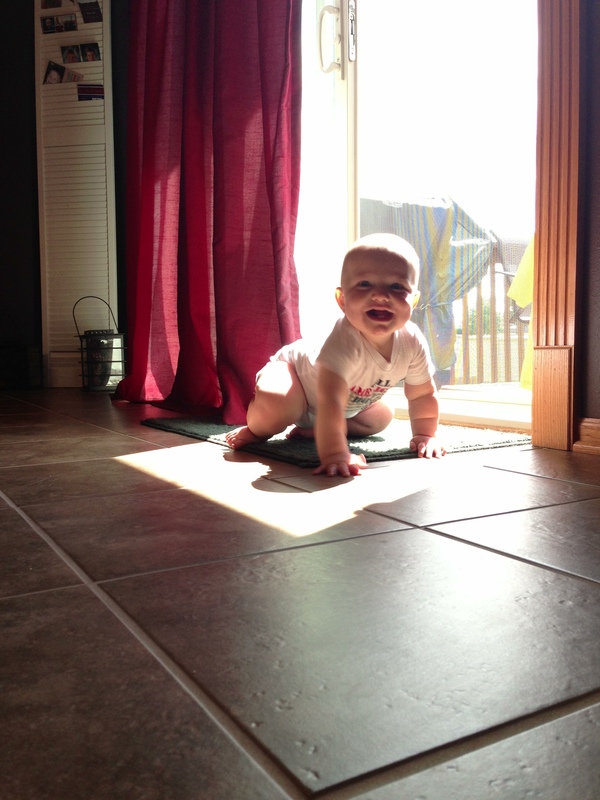 At the beginning of his seventh month he mastered crawling. It surprised me that he took so long to do it. I thought surely he’d have it down before he entered this month. But somewhere in the sixth month he took a break from crawling and was satisfied with using his toes to push him forward. His arms were basically useless. While he was taking a break from being on all fours, he figured out how to go from his belly to sitting up. Quinten gets an A++ for eating. And a grade much less for sleeping. I haven’t talked about it much because it’s taken a toll on me and left me feeling exhausted for the better part of his life. He started sleeping through the night at five and a half months. It was a glorious six weeks. Then he started getting up at 4 am to nurse and sometimes at 1 am also. I think we’re past it, again. He’s had a few consecutive days of sleeping through the night. Although I was pretty tired, I won’t fault him for it. Not surprisingly, he gained a pound this month. He’s now up to 20 1/2 pounds! He also had a lot going on: learning to crawl, sitting up, and getting a couple of teeth. That second week he was waking up, every time he was up he was sitting in his crib, sucking his fingers, holding on to his right ear, and screaming. We joked that he was pissed and trying to figure out why he was sitting up in the middle of the night. His top two teeth have both come in. One is barely visible and the other is about half in. Life could have been worse, but he still wasn’t very happy when they were starting to come in. Most nights he woke up crying before 11 pm. The short time we spend together in the evenings was a little trying during that time. He wanted to be held and usually didn’t know exactly what he wanted once you did that. But, I think we’re past that. He’s still trying to chew on everything and getting a lot of use out of teething rings, but that’s a pretty easy solution. My little baby is quickly growing up! He’s changing every day and if I’m not careful, I’m going to miss something! Right before he tried to bail out the front. 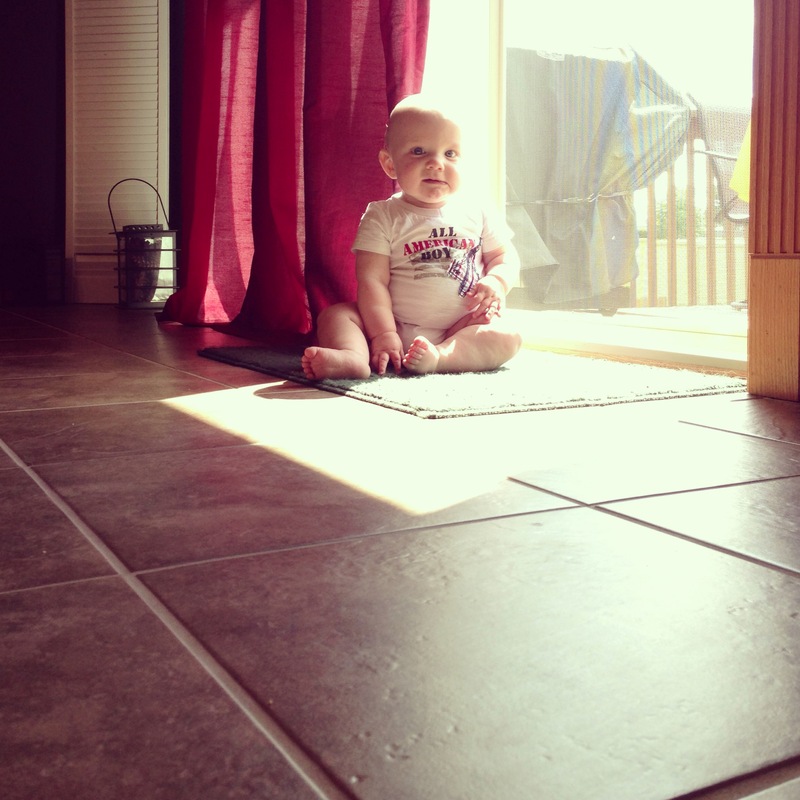 This entry was posted in Baby, Milestones, Quinten and tagged Seven months by Kyley Leger. Bookmark the permalink.